Tartakovsky, A. M. and T. D. Scheibe, Dimension reduction method for advection-diffusion-reaction systems, Advances in Water Resources 34(12): 1616-1626, doi:10.1016/j.advwatres.2011.07.011, 2011. Tartakovsky, A. M., A. Panchenko, and K. F. Ferris, "Dimension reduction method for ODE fluid models," Journal of Computational Physics 230(23):8554-8572, 2011. Battiato, I., D. M. Tartakovsky, A. M. Tartakovsky, and T. D. Scheibe, "Hybrid models of reactive transport in porous and fractured media," Advances in Water Resources 34(9): 1140-1150, doi:10.1016/j.advwatres.2011.01.012, 2011. Dr. Ilenia Battiato, who worked on this project as part of her doctoral dissertation with Prof. Daniel Tartakovsky at UC San Diego, will join the faculty of Clemson University in March 2012. She is currently a post-doctoral researcher at the Max Planck Institute in Goettingen, Germany, and was recently featured on German television as part of their Brilliant Minds series. Xu, Z., P. Meakin, A. Tartakovsky and T. Scheibe, "Dissipative-particle-dynamics model of biofilm growth," Physical Review E 83, 066702, DOI: 10.1103/PhysRevE.83.066702, 2011. Project Co-PI Dr. Alexandre Tartakovsky has been selected to receive an Early Career Research Program award from the Department of Energy's Office of Science. This highly competitive award provides $2.5 million over five years; the proposed research entitled "New Dimension Reduction Methods and Scalable Algorithms for Multi-Scale Nonlinear Phenomena" is an outgrowth of research performed under this SciDAC project. Battiato, I. and D. M. Tartakovsky, "Applicability regimes for macroscopic models of reactive transport in porous media," Journal of Contaminant Hydrology 120-121: 18-26, 2011. Ryan, E. M., A. M. Tartakovsky, and C. Amon, "Pore-scale modeling of competitive adsorption in porous media,"Journal of Contaminant Hydrology," 120-121:56-78, DOI:10.1016/j.jconhyd.2010.06.008, 2011. Palmer, B. J., V. Gurumoorthi, A. M. Tartakovsky, and T. Scheibe, "A component-based framework for smoothed particle hydrodynamics simulations of reactive fluid flow in porous media,"International Journal of High Performance Computing Applications, 24(2):228-239, 2010. 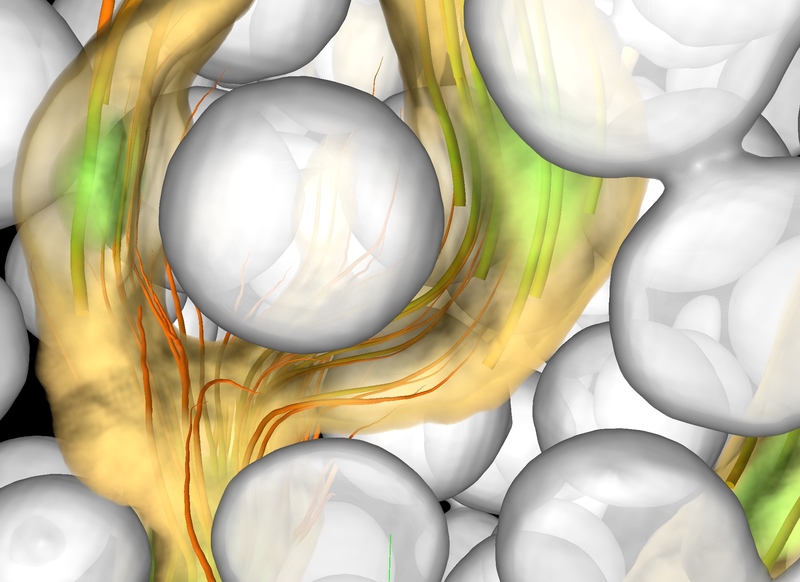 Zoomed-in view of a 3D visualization of pore-scale fluid flow computed using the parallel Smoothed Particle Hydrodynamics code developed under this project. Solid grains are represented as shaded gray quasi-spheres. Transparent surfaces indicate regions of high fluid flow velocity. Traces of individual fluid particles are also shown, colored according to their velocity (with bright green being the fastest particles). Visualization created by Kwan-Liu Ma and colleagues at the Institute for Ultra-Scale Visualization, University of California at Davis. Hybrid Numerical Methods for Multiscale Simulations of Subsurface Biogeochemical Processes: In this SciDAC Science Application, we are developing an integrated multiscale modeling framework with the capability of directly linking different process models at continuum, pore, and sub-pore scales. These codes will be modified and/or developed using advanced high-performance component architectures and efficient parallel solvers, and will be integrated into a component-based workflow environment to facilitate seamless integration of codes operating at multiple scales with different physical, biological, and chemical conceptualizations appropriate to the needs of specific simulation problems.